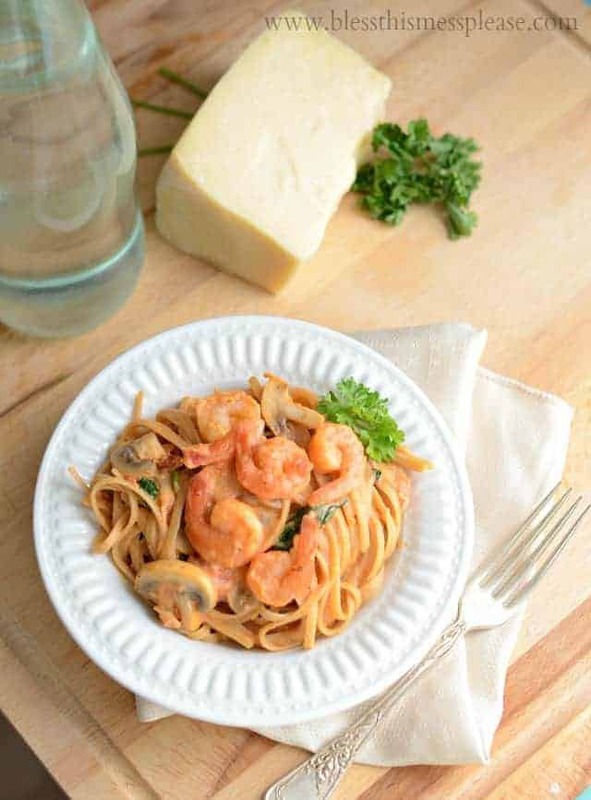 Linguine Rosa with Shrimp is healthy, full of protein, whole grains, veggies, and is done in 30 minutes. by Cassie Johnston (Wholefully). I started with the idea in the book (which is fabulous by the way) and made it into my own. 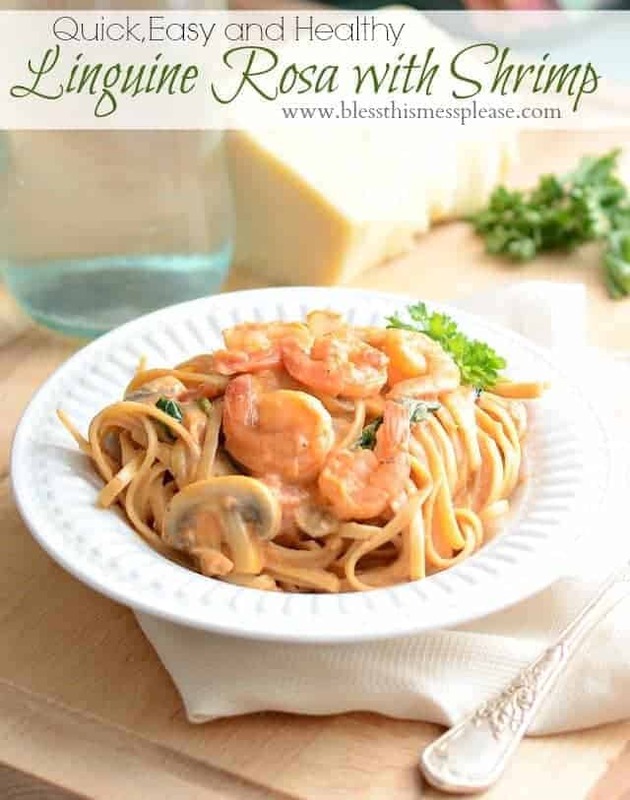 Linguine Rosa with Shrimp was a huge hit at my house! This recipe is healthy (full of protein, whole grains, veggies, and the creaminess is from Greek yogurt), it comes together in about 30 minutes, and it tastes amazing. My husband was so sad when the leftovers were gone the next day at lunch. Fast, healthy, and amazingly tasty, now you just can’t beat that! If you are trying to eat a little more healthy and clean then this is a great place to start because it’s just an all around great recipe. And it’s fancy enough that you could even serve this on a special occasion or to guests. Valentine’s Day is just around the corner. Cook the pasta according to package directions, cooking it for the least amount of time recommended. You want it to be al’dente which means to be a little firm to the bite. You’ll know when the shrimp is cooked because the exterior will be pink with red tails and the flesh slightly opaque. How long should I cook mushrooms? Cook mushrooms until they start to release their moisture, typically about 5 minutes. Cook the pasta according to package directions, cooking it for the least amount of time recommended. You want it to be al’dente. When the pasta is done cooking drain it and set it aside. Heat a large skillet over medium heat. Add the olive oil and the garlic and cook until the garlic starts to smell good, about 1 minutes. Add the red pepper flakes, mushrooms, and diced tomatoes to the skillet. Cook until the mushrooms start to release their moisture, about 5 minutes. Add the baby spinach and stir to combine. Bring the mixture to a light simmer and add the shrimp. Cooke for 3-4 minutes, stirring often, until the shrimp is cooked through. It’ll turn a creamy whitish pink when cooked. Remove the pan from the heat and and add the marinara and then the Greek yogurt, stir to combine. Add the cooked pasta and stir to combine. The hot sauce will reheat the pasta, but if you need to put it back on the burner, over medium-low heat, for a minute or two to reheat the pasta then you can. 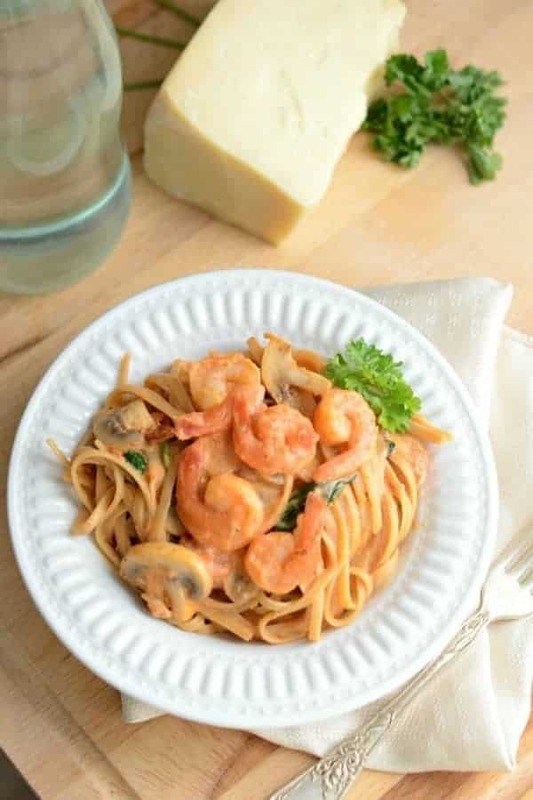 Serve the dish right away with the additional Parmesan on top. Hey, it’s Thursday! That’s a good enough reason in my book to make this recipe. Enjoy! That looks delicious enough to temp me into trying shrimp again! Any suggestions for replacing the mushrooms? And do you still think it’d be good with chicken? This looks so delicious Melissa! It was so fun getting to know you this past weekend!! Hard to imagine how a dish that is so elegant can be so healthy and easy to prepare. This goes to the top of the rotation! I’m eager to share it with our Cabot Facebook friends. You are going to love it! It’s pretty ridiculous how great and easy it is. Plus it’s good for you? Score! Sounds amazing! 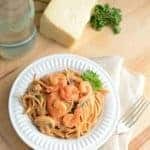 Do you have the calorie count for this recipe? I don’t but you can import it for free onto MyFitnessPal (it’s a free app) and I have great luck with that! Enjoy! I’m referring to the Linguine Rosa recipe, not the Pepperoni Pizza Lasagna Roll ups. I’m so glad you liked it! I always add a lot of salt that my family doesn’t eat, so it’s definitely a “to taste” thing. The lemon juice sounds really good! Tell your kiddos we said hi! Since this used some of the “I refuse to eat ingredients” on his list, a bit of camouflaging was necessary. Spinach was cut to 2 cups and was chiffonaded(he then thought it was basil…oh hahahaha), the mushrooms were chopped up fine(I don’t like the texture of shrooms either so fine was perfect, all flavor, no texture) and the yogurt was premeasured and hidden in a bowl(oh its sour cream I said). We both thought this was really good! I didn’t get as much sauce as your picture…..probably because I had to short change the mushrooms a wee bit….they didn’t last long enough and some were scary! Added salt…..a must in life! I have permission to make Shrimp Rosa again!!!! Yippeeee!! Goes perfectly with your Parmesan Focaccia too!!!!! LOL, I trick my kids and husband too, no shame!